The asta mangala are the eight (asta) auspicious symbols (mangala) of Buddhism. They are: White Parasol - Protects one from evil desires; Lotus - Symbolises purity; Two Fishes - Symbolises beings being rescued from the ocean of misery of earths existence; Conch Shell - Symbolises the blessedness of turning to the right and proclaim the glory of the saints; Wheel - Symbolises the wheel of the Law which turns 12 times or 3 revolutions for each of the four noble truths. 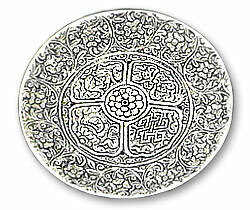 It is represented with eight spokes indicating the eight fold path of salvation. Standard - Signifies the victory of Buddhism; Vase - Treasury of all spiritual wealth and it also held amrita the water elixir immortality; Endless Knot (Mystic Diagram) - Symbolises the endless cycle of rebirth (also known as love, life or luck knot).